4mm correx custom printed with your artwork. 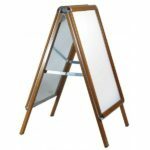 A2 sized in pine or oak effect frames with easy to use snap frames. Choose from pine or oak wood effect frames. Header panel for extra branding. 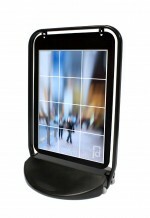 Choose from 6 frame colours. 6 frame colours available! Easy using magnetic poster pockets. Pavement signs are semi-permanent displays that can help businesses to advertise and attract attention in pedestrianised areas. 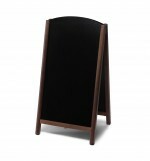 Our range of pavement boards include popular A-frames, swing boards and chalkboard signs. See our range above, or talk to us today on 0808 231 6063 if you have any questions, or can’t find what you’re looking for. What are pavement boards used for? 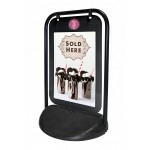 Businesses choose to use pavement signs to advertise latest offers, attract attention of passersby and to increase walk-ins and sales. What are the benefits of pavement boards? Which pavement sign do I need? Where you need to use it? Does it need to have a weighted base, or are you planning on using it indoors? 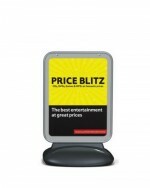 What size of poster, or message are you looking to display? 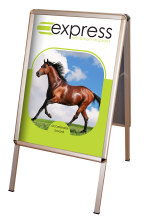 We stock pavement signs from smaller than A2 (actual size 15.51” x 20” size known as large post), to popular A1 pavement signs and our largest size of 40” x 60” (size known as 4 sheets/double quad). Does the design match my business? 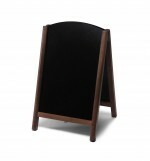 We stock a range of styles from chalkboards that are great to use outside restaurants to swing boards that would match a retail environment. 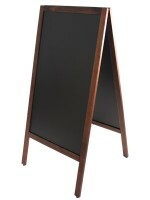 Sandwich boards feature A-shaped frames that can be stored flat. The supporting four legs are pulled apart to create the sturdy A-shape. 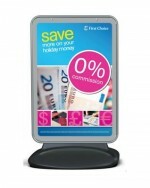 These are often the most cost-effective types of display. 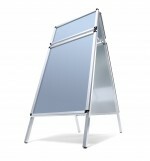 They are great to use if you plan on displaying your board indoors, or will move inside when not in use as they are often not weighted. 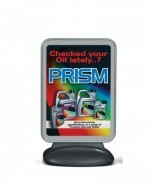 Swing board signs feature a swinging, or moving upright sign that will move in gentle weather conditions. 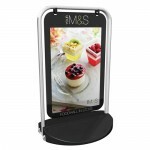 They often come with weighted bases, so are great for high-footfall areas or for regular outdoor use. 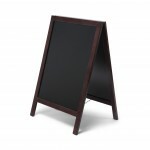 Chalkboard signs feature a chalk board to allow you to write your own messages! They’re often seen outside cafes, restaurants and pubs. How can I add my message to a pavement sign? Depending on the type of sign you choose, there will be a different way of changing your message. Don’t worry – all our pavement signs are really simple to set up and use. Most standard signs feature a snap frame, where a clear acetate covers your posters and is snapped shut to secure in place. 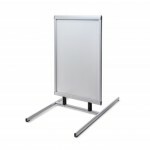 To change messages from a snap frame, simply open the frame and replace as often as you need – remembering to replace the clear anti-glare acetate which helps to keep your poster dry and visible. 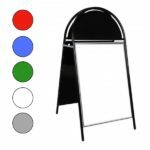 Some swing board and pavement signs feature a magnetic acetate cover that is simply gently pulled away to change over your posters. Chalkboards on the other hand display your own handwritten messages. Simply remove your old messages with a clean cloth and you’re ready to write your new message. 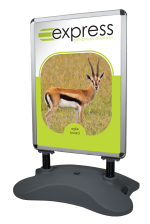 Why choose Express Exhibition Displays as your UK pavement sign supplier?